Rachel Wizman glides across the ice as if she were flying. She smiles as she dances around the rink, dressed in much warmer clothing than the Olympians practicing around her, as she observes their moves and their style, picking up tips and learning from them. Rachel, 15, of Monsey Hills, N.Y., was invited to practice figure-skating with the 25 ice skaters of the Israeli team at Sport-O-Rama, where she regularly practices, in Monsey, N.Y.
A student at Bat Torah Academy”“The Alisa M. Flatow Yeshiva High School – which recently moved from Suffern, N.Y., to Paramus – Rachel said she became interested in skating because of a friend about three years ago. So far, Rachel has skated only for fun and at recitals, but once she gets better, she’d like to compete. To that end she was given tips from one of the members of the ice skating team, a temporary Monsey resident, Tamar Katz, whom she met at a welcoming event at the JCC in West Nyack, N.Y.
Nineteen-year-old Katz, Israel’s top female singles figure skater who originally hails from Texas, made aliyah with the dream of representing Israel in the Olympics. She, along with most of the rest of the team members, have taken temporary residences throughout the United States and Europe in order to practice and prepare for upcoming competitions. This is necessary, said Carol Hasday, the general secretary of the Israel Ice Skating Federation, an immigrant herself (from South Africa), because Israel has only one rink, in Metulla, started by Russian immigrants 20 years ago. Four of the skaters have been practicing in Russia, while most of the national team has been quartered in several states in this country. Only the ice-racing team practices in Israel. Rachel Wizman, 15, helped raise money for Avukat Or and was invited to practice with the Israel team. Many of the members have trained in New Jersey, including Alexandra and Roman Zaretsky, a brother and sister team ranked ninth in world championships; Ekaterina Sozinova and Fyodor Sokolov, a married couple who are Israel’s pairs representatives; and Galit Chait, who grew up in Paramus and lives in Kfar-Saba, Israel, and her partner, Sergei Sakhnovski, who together won a bronze medal in the 2002 World Championships and will represent Israel in the 2010 Olympics in Vancouver. In order for the members of the team to practice, have the opportunity to perform in front of an audience, and to be judged as skilled enough to make it to the Olympics, they were being observed by the judges of the Israel Ice Skating Federation at the Monsey rink. “Our criteria in Israel are much, much harder than the world Olympic criteria,” said Hasday. The Aug. 31 practice and free performance served a number of purposes, said Hasday. First, it gave the team a unified training camp. It also celebrated Israel’s 60th anniversary by performing for the local Jewish community. A special purpose was to kick off an awareness campaign for a drive organized by school hockey team members to raise money for Avukat Or, a special-needs hospital in Israel. Last year, Fisher to save his team decided to include some other school hockey teams in its drive. The money collected ($10,000) went to help children who live in Sderot, a town in southern Israel that is being bombarded by Palestinian missiles. Reaching out to other schools, with more than 20 so far responding, “we would ask each school to assign a student to be in charge of a program to raise $1,000, the goal set for each school,” Fisher explained. Yavneh Academy in Paramus and the Moriah School of Englewood also took part in the drive. 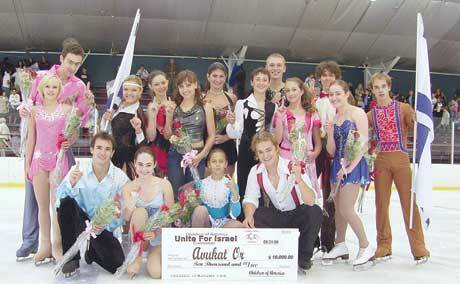 At the end of the skating event, the schools presented a check for $10,000 to the Israeli team, which it will bring to the hospital after the European competitive season. The team will also bring the hospital blankets made by the knitting club of the Fountainview Retirement Complex in Monsey.